I know this is a stray from my usual posts about cupcakes, goats and general randomness, however I’m probably long overdue for a geeky post within this ‘Way of the Geek’ blog. Plus, the subject is very relevant to me as, although I have no intention of joining the hordes of clammy technophiles in a queue for what is essentially an over-hyped upgrade (Apple you wizards, how do you get away with it each year? ), as I now work within the Wireless department of an Expense Management Consultancy the release of the iPhone 5 is going to have a big impact on my professional life in the near future. You see, the end users of the Clients that I handle will soon be clamoring for the new iPhone 5, therefore there will be no end to frantic queries as to whether someone is eligible for an upgrade on their existing device, with firstborn children being offered as bribes in order to overlook a watertight 2-year contract. Tears will be shed, tantrums will be thrown, Departments will go to war. 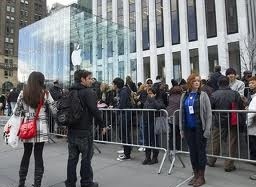 Although it’s suspected Apple may allow pre-orders for the iPhone 5 to be placed from as early as after the close of their media conference today, it’s more likely that pre-ordering will open this week, on Friday the 14th. The predictions surrounding the release date are based on Verizon and AT&T (some of the usual mobile Carriers of Apple’s iPhone family) making September 21st-30th vacation blackout dates for their employees. FedEx have also issued an internal memo preparing their people for a surge order event from September 21st-24th. The predictions surrounding the Friday 14th pre-ordering opening is based on Apple massively increasing their Sales Support Teams staff for 6am for Friday the 14th. It’s going to get messy people, so remember to always carry a brown paper bag in case of panicked hyperventilating, and pack pepper spray in order to defend you place in the queue outside your Apple store of choice. As a silver lining, now is a really great time to pick up a cheap iPhone. I guess I’d better mark my calendar to go to Ginza the day before, in order to take a photo of the world-class line of Japanese waiting for the Latest If Not Greatest. Aieee. Will bring paper bags as a public service.